An ideal starter for micro-sized beginners or a neat electro uke with bass strings. Tidy build. Onboard pickup helps with gigging. String spacing is a little cramped. Price. 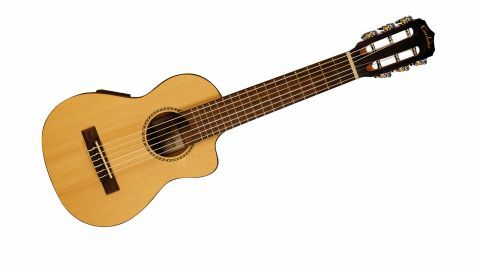 Cordoba makes primarily nylon-strings at a variety of levels, as well as ukes and a smattering of steel strings. With its recent acquisition of Guild and new UK distribution, it's a name you'll be seeing more of. "The onboard pickup with two-band EQ and volume preamp means it's perfectly giggable and recordable"
This diminuative Guilele is hardly a new concept - Yamaha's Guitalele has been around for ages - but Cordoba's take is different, not least in this solid spruce-topped cutaway electro format, although both acoustic and lower-spec pack versions are available at £199 and £115 respectively. Essentially a six-string tenor uke, it's tidily made with a 50mm string spacing at the bridge - the same as your Les Paul - with a 46mm nut width, slightly wider than your 2015 Les Paul (though narrower than Yamaha's Guitalele nut width of 49mm). But these are nylon strings, so it feels pretty cramped. Tuned as if you're capo'd at the fifth fret, it's easy enough to get used to and once, like any uke or nylon-string, those strings have settled in, it's a lot of fun, adding some well needed bass to the uke's high-pitch plink. The onboard pickup with two-band EQ and volume preamp means it's perfectly giggable and recordable. If you can't get on with a standard four-string uke, or if you want a very compact six-string electro-classical, this isn't such a daft option, Essential? No way. Fun? Definitely.